As more and more communities across the country experience gentrification—and others fear its imminent arrival—community developers are struggling to find ways to respond. At a minimum, we seek to slow, or mitigate the process to diminish the disruption to the lives of current residents. Ideally, we would find ways to create inclusive neighborhoods that welcome newcomers while enabling long-time residents to stay and benefit from new jobs, services, amenities, and maybe even better schools. Indeed, our best hope for reducing racial segregation in our country is to achieve such a result. New affordable housing units (inclusionary or government-subsidized) may help retain the income mix of the neighborhood, but those units may or may not prevent displacement of existing residents because the people who move in could be from outside the neighborhood. To increase their efficacy as anti-displacement tools, we would need to offer a neighborhood preference for new tenants. Current fair housing rules, however, often prevent or severely limit such preferences. Given this reality, I believe that key actors in the affordable housing system need to overcome their reluctance to acquire existing apartments and preserve their affordability before it is too late. This is the only way to truly prevent displacement of current residents since they live in buildings that already exist—not ones yet to be built. Several CDCs in Boston and nearby Somerville have begun to do this effectively. We have many brilliant affordable housing professionals in Massachusetts and we should be able to develop scalable models for doing more of this. I’m confident it can be done for less money than we now spend on new affordable housing developments. The affordable housing system also needs to shift more of its resources to promoting homeownership as a stabilizing mechanism in gentrifying neighborhoods. Right now, the Commonwealth of Massachusetts spends 100 percent of its affordable housing development dollars on rental housing. Shifting 5 to 10 percent to homeownership could help stabilize our communities. Indeed, we need a full-scale effort to address the vast racial homeownership gap not only in our state, but in the rest of the country as well. While housing displacement gets most of the attention, I am increasingly concerned about cultural and economic displacement. When longstanding, locally-owned small businesses are forced to move (or worse, close), it impacts not only the business owner, but the entire community. Similarly, as the demographics of a place change, many residents feel the loss of their cultural community and home. Advocates are now fighting to help local businesses stay open. CDCs and others are increasingly using the arts and creative place-making (and place-keeping) to claim (and retain) their communities’ historic and cultural narratives. The good news is that, compared to housing development, these interventions are relatively inexpensive. The bad news is that there is little public funding to support such programs. This needs to change. The biggest point of controversy, both among our members and in the broader community, is whether new housing development helps or hurts. Some argue that we must build new housing in gentrifying neighborhoods to take pressure off the market and to accommodate rising demand. Many urban planners promote greater density and large-scale development as a solution to gentrification. 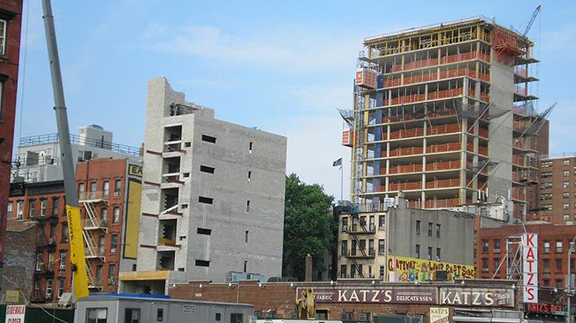 At the same time, others blame these very developments for accelerating the process of gentrification. They believe high-end units attract upper-income people to the neighborhood, bring higher-end retail, and begin to change the character of the place, even if they include a significant percentage of affordable units, which often are occupied by lower-income newcomers—not longstanding residents. I agree with both sides. New development might very well speed up the gentrification process, but stopping development will also speed up gentrification, as pressure will continue to build on the housing stock in changing neighborhoods. Unfortunately, the intensity of this debate can itself become an impediment to progress because it can undermine trust among otherwise allied partners. On balance, I’m generally inclined to support new development, but only if it is done wisely. I think we need to mitigate the impact of new development with more than just inclusionary units. Fighting over 15, 20, or even 25 percent affordability levels does not confront the core issue of neighborhood change. Instead, we should use some of the resources generated by new development to attack displacement more directly through measures such as acquiring existing properties, providing financial assistance to current homeowners and tenants, supporting locally-owned businesses, and making cultural investments that preserve a community’s history and culture. We should also push for more three-bedroom units in new buildings because those units would allow more families to move into changing neighborhoods. Those families, in turn, not only might enroll children in local school,s, but they also are likely to press for improved schools, which would benefit all of the neighborhood’s families. I make these suggestions knowing there are no easy answers and no complete answers. Neighborhoods are always changing and demographics continually evolve. Sadly, in a society with vast and growing income and wealth inequity, these dynamics are going to continue. Perhaps the only long-term and scalable solution to gentrification and displacement is to restructure our economy in ways that will make it more fair and equitable. This post is a response to the Panel 6 papers that were presented at our A Shared Future symposium in 2017. These papers are available on the JCHS website.